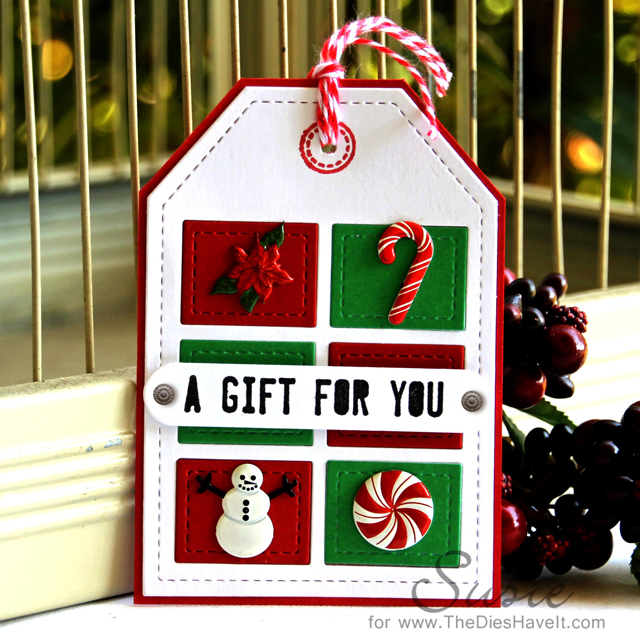 Isn't it fun to make your own gift tags? I've made some fancy ones, but I thought I'd share this very simple one with you today. The white tag base is from Pretty Pink Posh. I cut it a few times - once each from white, red and green card stock. I used the white as the base and added in the windows from the other colors. Then I added fun holiday brads from Eyelet Outlet and a little label that I used for my sentiment. I matted the completed white base with a larger red tag and then drew the twine through the little hole. This is such an easy project and really could be made for lots of different occasions just by changing the colors and the brads. I hope you have a marvelous Monday and I'll see you right back here tomorrow for more holiday fun!